The Autotech SmartPower is a DC switching power supply with 24V output Voltage. 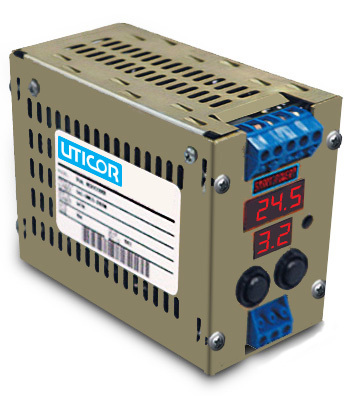 This user friendly power supply has two 7-segment LED displays for voltage and current monitoring. The SmartPower field programmable 30 W, 60 W, and 90 W power supplies from AVG Automation include built-in displays for current and voltage readout and pushbuttons for setting current limit. They can show operating life left and include built-in digital displays that provide, at a glance, additional information without connecting a meter. The NEC Class 2 models add flexibility through easy, field-programmable current-limit using the displays and two buttons. A pre-failure warning alarm can go to a stack light or other device accepting the output signal. Other attributes include DIN mount compact metal housing at 3.1 in. x 2 in. x 4 in. deep, U.S. manufacturing, and plug-in connectors for easy maintenance.